Where are Interest Rates Headed, and Why Should You Care? All eyes are on Janet Yellen, Chair of the US Federal Reserve, these days to try to anticipate where interest rates will go. For the United States, the talk is all about when and how high, not if. In Canada, it is a different story. Bank of Canada Governor, Stephen Poloz, reiterated that rates are not expected to go up yet. Many analysts believe there won’t be a rate increase until some time in 2018. Our economy is not growing meaningfully enough, and there is no inflation to worry about. Rate increases are a monetary tool to tame rapid growth, and to contain inflation. While low interest rates are good for Canadians’ pocket books, for now, eventually, rates will go up here in Canada too and this is nothing but bad news for those with too much debt. Unlike the Americans, Canadian debt levels have steadily been increasing in recent years. Raising rates too high or too quickly risks a huge debt problem for many Canadians. A recent report by credit monitor TransUnion shows that up to a million Canadians would suffer financial stress if rates increased by 1%. However, rates are likely to increase by 2 or 3%, not only 1%. The Bank of Canada’s own research, states that the Bank’s natural rate of interest is in the range of 3% to 4% (*). This means that the best bank rate to consumers would be in the 4% to 6% range. That kind of increase would translate to considerable economical damage, and would be devastating to real estate markets. We should care very much about interest rates as they impact us in many ways. Our best word of advice is to use current low interest rates to reduce debt as much as possible. Make sure that you can easily afford a 5-6% interest rate on your mortgage, for example. Manage your credit responsibly, and borrow only what you can afford at the anticipated higher rate. 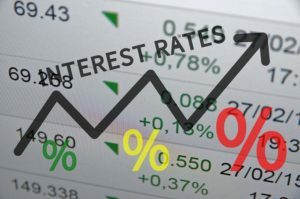 Rate increases will also have an effect on your investments. Make sure that your portfolio is well balanced, keep fixed income in the lower range of your target allocation and select dividend paying equities which will help keep up with inflation and reduce volatility. Finally, don’t miss your annual portfolio review. This is becoming more important as we approach these uncertain times. This is when we rebalance your portfolio and review your circumstances in light of the current economic environment. (*) Globe & Mail – Unlike the Fed, the BofC is constrained by a paradox of household debt. Sept 22, 2016 Louis-Phillippe Rochon Professor at Laurentian University.